Russian pilots have been carrying out training flights with the carrier-based aircraft training simulator. However, it is not possible to use it at full capacity at present. After the entry of Crimea into the Russian state structure, pilots regained access to the NITKA carrier-based aircraft training simulator. But the expediency of using it is questionable. Su-27 pilots from the Admiral Kuznetsov aircraft carrier have carried out detailed training flights with the NITKA deck simulator, which had once left Russia along with Crimea. The simulator was rented from the Ukrainian military. But with the start of the construction of a more up-to-date analog in the city of Yeysk, by the Sea of Azovsk, the use of the Soviet simulator by Russian pilots was cut short. With the re-entry of Crimea into Russia, the aviation group acquired the opportunity to again try out the aging, but unique deck simulator. The simulator is a unique training complex in the form of a steel runway identical to the deck on the Admiral Kuznetsov. The complex is equipped with a runway block that has an arresting gear unit – the device which breaks the force of an airplane landing on the deck of a ship, take-off ramps, and an overclocking device – a catapult. 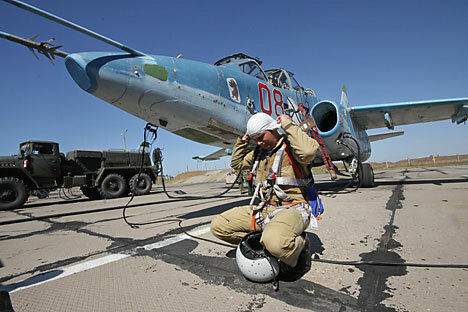 After Ukraine attained independence in 1992, the Russian Ministry of Defence rented NITKA for training pilots. The simulator had a system which imitated various weather conditions. The technology was based on seawater energy. Seawater entered into steam engines, converted into steam, and started up the cylinders to create the simulation of a deck rocking in the waves of the sea. NITKA was situated so close to the water that an airplane was directly above the Black Sea during take-off. This created a deck take-off that matched reality as closely as possible. In the early 2000s, the simulator started to become technically obsolete. Besides, the Ukrainian military did not invest in the modernization and renewal of the Soviet simulator. Modern conditions required the creation of helicopter zones for training exercises on deck. Thus, in the spring of 2012, the construction of a new NITKA simulator in Yeysk was initiated at the order of the Russian Ministry of Defence. In 2013, with six months remaining until the launching of the new simulator, the decision was made to cancel the lease on the Ukrainian “firstborn.” The Ukrainian Ministry of Defence tried to rent its Soviet legacy to the Chinese comrades who rebuilt the Soviet aircraft carrier Varyag in Liaoning. But the Chinese did not want to spend money as they had already finished building their NITKA analog. There was a similar situation in relation to India, which launched a deck simulator that had been developed in cooperation with the Russians at a total investment of $60 million. In 2014, the Ukrainian military planned to saw the NITKA into pieces, but did not follow through. Notwithstanding the fact that Russia has repatriated its simulator, it is not possible to exploit it at full capacity today. Independent aviation expert Vladimir Karnozov believes the Crimean NITKA has aged, and its future exploitation and renovation is inexpedient due to the fact that a modern NITKA in Yeysk has come into being. The new simulator will have training grounds for helicopters added in the coming years. Karnozov told RIR that the Crimean simulator can be used by MiG-29 pilots as a springboard for overclocking. That is, it is a partial imitation of a take-off from deck. Today, the entire technological base of the Crimean NITKA, including the brake machine, needs to be reconstructed. Aviation systems experts also take note of the prospect for the introduction of full flight simulators to the mobility system as an important addition to real training flights. Vadim Smirnov, the Director of the Transas Aviation Group told RIR that full flight simulators on the mobility system allow for the realistic modelling of very diverse situations, including adverse weather conditions. In addition, a full flight simulator can be located in any convenient place free of dependence on the area where real training is held. At the same time, the simulator ensures the cost-effectiveness of the preparation process at a significantly higher level of security for the educational process. Experts believe that the Crimean simulator can be opened as a training centre and pilots of carrier-based aircraft from China and India could be trained there. Despite the fact that they have created their own NITKA analogs, the number of aircraft carriers that Russia's allies have is growing. China has started building its second aircraft carrier, as has India, and these countries may need additional training areas.